Dental Implant is the Best Way to replace a tooth. The Implant Dentists at Natural Dentist Associates in North Bethesda Maryland provide complete tooth replacement services from tooth extraction, implant surgery to placement of Implant Crowns. There are alternative treatments such as a dental bridge and a removable denture. Dental Implants do not connect to other teeth are free-standing and consist of a new root or the dental implant and a zirconia crown. The picture to the left shows the Zirconia crown and a tooth-colored Zirconia Dental Implant. Natural Dentist Associates is a full service Dental Implant Center. IV Sedation Dentistry is available for this procedure in Rockville, Maryland. When is the Best Time to Get a Dental Implant? The best time to replace a tooth is at the time of tooth extraction. Our Dental Implant Specialists will carefully extract the tooth and immediately place a dental implant into the tooth extraction site. This is called immediate dental implant placement. The next best option is to place the implant as soon as possible after a tooth has been extracted. This is called “delayed implant placement.” A delay in implant placement will cause gum and bone loss and may cause a need for gum and bone grafting. A delay in tooth replacement and implant surgery should be kept as minimal as possible. PRF treatment is recommended for all Dental Implant procedures. 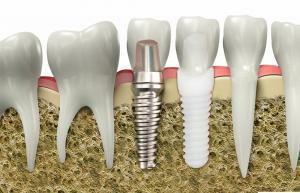 Dental Implants do not hurt very much in fact most patients do not report more than mild soreness after the procedure. After the new root or dental implant is placed it needs to heal for 8-10 weeks. At this time the implant dentist will place the Zirconia Crown. The special connector that connects the the Zirconia Crown to the dental implant is called an implant abutment. The cost of a dental implant depends on the kind of dental implant, the manufacturer of the dental implant and the fee charged by the implant dentist. Dental Implants can be made of Zirconia or Titanium. Different manufacturers have been in the dental implant business for different periods of time. The newcomers have less money and have a tendency to go out of business. If an implant company goes out of business, new parts for maintenance in the future cannot be purchased and the implant is useless. Most experienced implant dentists will not use lower cost implants from financially unstable dental implant manufacturers. Like most other things, you get what you pay for and implants are not exception. In the Washington, DC area dental implants cost between $1500 – $3000. Of course the dental implant needs an abutment (the connector between the crown and implant) and a crown which together cost another $1500 – $3000. There are a few dental practices operating as dental implant centers where dental implants, abutments and crowns are done in the same office. When a patient considers the cost of a dental implant, he/she should really look at the combined costs of the implant, abutment and the crown which is the entire unit replacing a tooth with a dental implant. The cost of a single tooth dental implant including dental implant, abutment and crown in the Washington, DC area is between $3500 – $5500. If the patient needs gum or bone grafting, the cost may be higher.